The ZW700B membrane, with its SevenBore technology provides a mechanical strength 10 times that of single fibres. 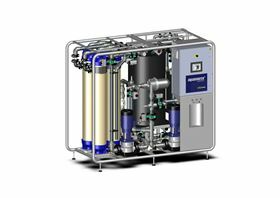 Suez Water Technologies has released its new scalable, automated ultrafiltration (UF) unit, the aquasource Z-XS, designed for municipal and industrial process water treatment. Aquasource Z-XS can handle up to 500 m3/day of water a day and combines the benefits of the company’s ZeeWeed 700B high strength SevenBore ultrafiltration membrane with the aquasource smart process automation, removing particulates, bacteria, and viruses. The company says the aquasource Z-XS brings lower operational costs as a result of reduced chemical and water consumption combined with minimal fibre breakage. The ZW700B membrane, with its SevenBore technology provides high mechanical strength (10 times that of single fibres) and operates in many different pH conditions. An inside-out flow orientation also eliminates the air scouring step and the need for additional related equipment. In the Suez aquasource systems, a procedure called low pressure ultrafiltration permits the clarification and disinfection of water in one step. A membrane barrier acts like a filter for all particles over 20 nm in size such as pollen, algae, bacteria, viruses, germs and organic molecules. The technology is environmentally friendly as it reduces treatment waste and the need to use chemicals. Suez names Yuvbir Singh as CEO of its Water Technologies & Solutions (WTS) division, effective 8 April 2019, succeeding Heiner Markhoff.